At the end of every academic year, school owners and administrators start pulling together their Professional Development (PD) plans for the long vacation in preparation for the next academic year. Meanwhile, teachers sit anxiously and grumble over the next dreaded PD days that their contract says they must attend. It’s not that teachers don’t want to grow and improve their skills. They do, and they find it refreshingly professionalizing when they get to. It’s just that this isn’t their first rodeo. They’ve been made to sit through pointless professional development in the past and they lament that they’re thinking “how long will this last and what will I have to turn in…and when is lunch?” as they trudge toward the pathway down the school hall that so obviously lacks the normal student energy they’ve used as fuel for the past 9 months. But it doesn’t have to be like that. In fact, if we do things well, teachers are likely to come away from their professional development energized and excited. 1. 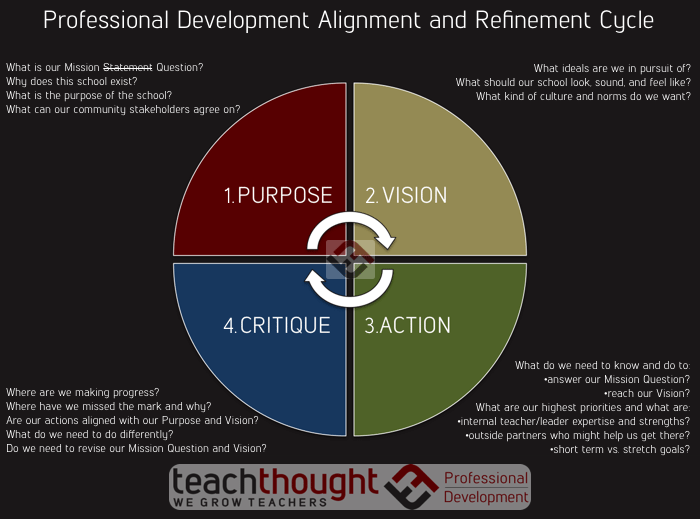 Teachers prefer PD that is relevant to their context. Seems like a no-brainer right? But how often have we sat in meetings listening to someone talking about something that isn’t directly relevant to what we teach? To be fair, that’s an overly simplistic way to look at this. But for the cynical teacher (and really all teachers) who’s been to this rodeo before it’s important to be intentional in including and growing PD from your teacher’s voices. So ask them what they want and what they need, but place it in the context of the school’s Mission and Vision (you’ve clarified those right?) and their own personal purpose and growth. Are they aligned? Are their short term and stretch goals that they’re working on? Are they beginning teachers or experienced? How do they see themselves in the ecosystem of the school? What do they need to know and be able to do better in order to achieve their ideal selves? 2. Teachers prefer PD that helps them plan and improve their instruction. This doesn’t mean that everything in your PD should be lesson planning time. It does mean that teachers should have ample work time to plan and meaningful processes to reflect and refine their instruction. Sometimes this means challenging each other and themselves by discussing new approaches. Or perhaps teachers are critiquing each other’s planning and teaching through the lens of a quality rubric. What about significant work time with thought partners from both inside and outside of the school to collaborate and ask questions? What it can’t be is large chunks of time spent on things that teachers don’t see as helpful in improving teaching and learning. 3. Teachers prefer PD that is teacher-driven. Teacher-driven doesn’t necessarily mean that teachers are the ones “leading” the work. While “unconference” types of PD where teachers are presenters can be a great part of a balanced PD approach, having an outside partner that grows the professional learning from the questions of teachers can be powerful. This relates back to the first quality of PD and the issue of context and in a truly inquiry-based approach teachers are identifying what they need to know and understand in order to reach their goals. Leadership is supporting them with PD that is driven by those teacher voices. 4. Teachers prefer PD that includes hands-on strategies applicable to their classroom. Nobody likes sit-n-get. Students don’t and teachers certainly don’t. If your professional development is stuck at the bottom of Bloom’s taxonomy only delivering basic facts, ideas, and concepts for consumption it’s going to be a dud. Better to ask teachers to move up Bloom’s by applying that learning to their work which can help them make meaning. Best is to ask them to move from consumption to creation and contribution at the start so they can contextualize the thinking and strategies as they may apply in their classroom. Does your PD include deliverables from your teachers (and leaders!) that require deep thinking and collaboration? Will they walk away with something they can use in the short term but also fits into a wider context of growth? 5. Teachers prefer PD that is highly interactive. I’ll say it again. Nobody likes sit-n-get. That doesn’t mean that your PD should be full of silly games and stuff that “gets you on your feet” for no real purpose. Start your PD off with what I jokingly call “reindeer games” and you’ll lose your cynical teachers instantly. Engaging teachers in active thinking, processing, and dialogue while at their seats can be rewardingly interactive. Mixing that with things that do get them moving like a Gallery Walk or “The Scissors Game” (pictured on the right) where teachers practice the 4 C’s of Communication, Collaboration, Creativity and Critical Thinking and more outside of the heavy content of the workshop can be great brain breaks to keep the work moving forward. The adage of hands on and minds on works here, just be purposeful in your efforts to not let things get stale. 6. Teachers prefer PD that is sustained over time. Education is like most other industries in that we have our fads and cycles. Today’s buzzword can be tomorrow’s memory and the fatigue that builds up over time can make the prospect of upcoming PD days feel tortuous. Aligning your PD with your overall Mission and Vision is a first step in helping break this cycle of “latest, greatest thing!” because it requires an intentional analysis of long-term goals. It’s also important to recognize that significant shifts in practice take substantial time and work. So while your teachers engaging in something like a project-based learning workshop can be a great start it’s not likely to make the impact you’re seeking without sustained followup. Teachers need to know that the work they are doing in any given PD will be relevant down the line and the cynical ones will opt-out until they feel comfortable that this will indeed be the case. 7. Teachers prefer PD that recognizes they are professionals with valuable insights. This seems like it might be a statement from Captain Obvious but unfortunately it needs to be said…and repeated. In my 15 years as a teacher I had several administrators run PD/meetings where they made an attempt to recognize teacher voice by saying things like “the answers are in this room.” What they really meant was they were going to let the teachers talk until they said what the administration wanted to hear. Not only does this not honour teacher’s voice, it leaves a sour taste of condescension. In my experience leading professional development I have experienced very few teachers who weren’t passionate about their craft and elated when given the opportunity for professional dialogue. When we engage teachers in peer critique of their units and lessons in our workshops they light up with the joy of collaborating in meaningful ways. Administration doesn’t have to relinquish control to do this. In fact, just like in the classroom, that control is illusory and the real gold is in flattening the hierarchy and engaging alongside teachers asking beautiful questions to help guide the work toward your collective vision. Looking to grow your school?